A new WIPO report shows that in 2012 global patent filings increased at their strongest rate in nearly two decades as industrial-design registration notched its best-ever rate of growth. Intellectual property (IP) filings have sharply rebounded since a 2009 decline at the height of the financial crisis. 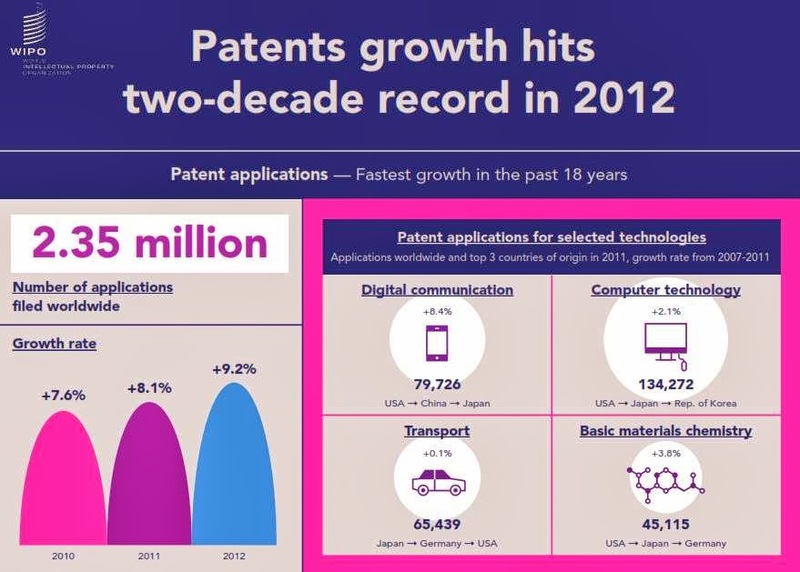 Patent filings worldwide grew by 9.2% in 2012, representing the fastest growth recorded in the past 18 years. Following a 3.9% decrease in 2009, patent filings worldwide have now rebounded strongly, with accelerating growth rates – 7.6% in 2010, 8.1% in 2011 and 9.2% in 2012. This was mainly due to strong growth in filings at SIPO. The estimated 2.35 million patent filings worldwide in 2012 consisted of 1.51 million filed by residents and 830,000 by non-residents. Among the top 20 IP offices, SIPO (+24%) saw the fastest growth in filings in 2012, followed by the offices of New Zealand (+14.3%), Mexico (+9%), the United States Patent and Trademark Office (USPTO, +7.8%), and the Russian Federation (+6.8%). Several offices of middle-income countries, such as Brazil (+5.1%), India (+3.9%) and South Africa (+2.7%), also reported growth in filings. Patent filings by field of technology differ across origins. Residents of Israel and the US filed a high share of their applications in the computer and medical technologies fields. Applications filed by residents of Belgium, India and Switzerland were more concentrated in the organic fine chemistry field. Resident of Brazil filed a high share of applications in basic materials chemistry, while China and the Russian Federation focused their filings on material metallurgy technologies. In contrast, a higher share of applications filed by residents of Japan, Singapore and the Republic of Korea fell within the field of semiconductors. Residents of European countries such as France, Germany and Sweden focused their filings on transport-related technologies. “Italy’s people have long been admired for the everyday creative expression that contributes to la dolce vita. This includes a culture of excellence in design that applies aesthetic considerations to everyday objects, taking them from the prosaic to the sublime,” said WIPO Director General Francis Gurry in his introductory message in the exhibition’s Italian Design Innovation – ADI Design Index 2012 catalogue. Alessandro Sarfatti, former CEO of Luceplan, attributed the success of Italian design to the “fantastic alchemy” that exists between entrepreneurs, designers and suppliers. “These three actors have made Italian design what it is today,” he said. “The designer brings into the company his vision of the world, his ideas and then it is up to the company to stick to the project and realize it,” he said pointing to his experience in developing the iconic “Hope” lamp. Built around the idea of the lighthouse lamp developed by the 19th century French physicist Augustin-Jean Fresnel, the lamp is the product of a lengthy iterative process. After months of experimentation, the mutual trust that existed between the company and the designers, made it possible to overcome design challenges and to produce a high quality, commercially successful product.